The Yahapalana Government completed four years on 8 January this year. The four-year journey was a rough ride with a clear rift between the President and the UNP; the ruling party. The Government continues to face severe criticism from both inside and outside. Prior to any comment on the economic performance, it would be necessary to understand the key policy differences of the two administrations, prior to and post January 2015. The UPFA Government led by the former President was believed to be influenced by the left-wing thinking and rely on strong government for running the economy. Economic growth in post war era from 2009-2012 was markedly higher, largely due to rebuilding of infrastructure and economic integration of north and east after the completion war in 2009. The economic policy was more inward-looking. The economic growth primarily derived from the domestic economy, through large infrastructure spending, funded by the foreign loans obtained by the Government. Except the promotion of tourism sector, industrial production and export sector were neglected. As a result, export share of the Gross Domestic Product (GDP) took notable downward trajectory over the years. The economic growth increased disposable income (evidenced by the growth of per capita income) of the people and the miniscule export earnings were quite insufficient to meet import demand for the manufactured goods. The domestic business sector influenced the Government to protect domestic industries, largely monopolistic or oligopolistic in nature, via trade barriers making them less competitive internationally. From the fiscal side, public debt increased at a rapid phase since the Government borrowed funds for large infrastructure spending. To meet ever raising foreign debt financing commitments, the Government turned towards short-term interest arbitrage funds, known as hot money which was readily available at that time due to the ultralow interest rate regime prevailed in the west. 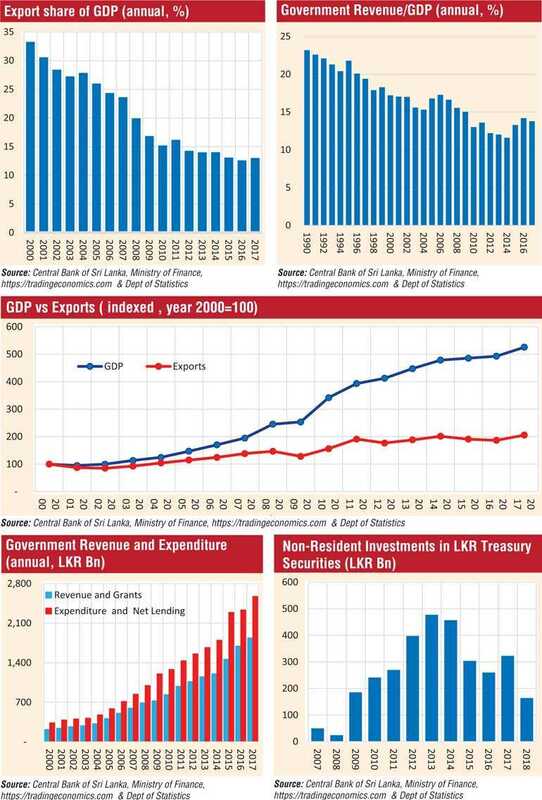 The Government allowed hot money into LKR denominated Government securities. By the end of 2014, this accounted for $ 3.5 b, compared to official foreign reserves of $ 8.2 b. However, there was no strategy to refinance the gap when that hot money leaves the country. The economic policy of the Yahapalana Government was not vastly different. The Government had to find financing to fund popular and profligate election promises, such as massive Rs. 10,000 pay hike to nearly 1.3 million State sector employees. By 2015, debt service commitments of many loans, obtained by previous administration for infrastructure spending, were due for repayment. Since the returns of those projects were not sufficient to finance debt service commitments, additional funding was required. Expansion in the budget deficit was inevitable. The Finance Minister vigorously followed up and made strenuous effort to improve the revenue collection process. As a result, the Government was able to increase the Government revenue to marginalise the effect of highest-ever increase in the Government expenditure in the recent history. By that time, the Finance Minister was virtually handicapped without the required institutional setup, which usually comes under the Ministry. To his credit, with only three main institutions under his purview, he was successful in increasing the Government revenue by 21% and 16% during 2015 and 2016 respectively. This effort bucked the declining trend observed in Government revenue during the previous decade. After 10 years, the Finance Ministry was able to increase Government revenue as a percentage of GDP. The Finance Minister, for his exertion to establish fiscal consolidation via raising revenue, was recognised as the Best Finance Minister of the Asia Pacific region by financial magazine The Banker. Apart from the fiscal consolidation initiatives and certain fiscal reforms agreed with the IMF, the Government failed to undertake necessary economic reforms. The external pressure continues with the exit strategy of the Fed, central bank of the USA. The economic growth virtually came to halt while regional peers were growing at rate of 5-7% range. There was a slight pickup in exports towards latter part, but no clear strategy in making the country competitive in international market. Our export remain highly concentrated and yet no visible effort is made in diversifying the export base. There were two finance ministers during the four-year period compared to one finance minister during the 10 years prior to 2015. One finance minister was only the minister in charge of revenue collection, however, lately the current minister received all institutions which typically come under the Ministry. The institutional set up and the public officials remained unchanged. The marked difference was the panel of key policymakers and advisors of the Government (not referring to present advisors of the Finance Ministry). Key economic policymakers of the previous regime ware pragmatic and practical though they never intervened to change the left centric economic views of the former President. In contracts, the advisors of the present Government are textbook style and lack comprehension. As a result, the Prime Minister continues to make economic policy announcements one after the other without serious action plans behind them for better execution. Contrary to popular belief that the economy is handled by the Finance Ministry, the Government chooses the economic policy while the Finance Ministry plays a lead role in policy formulation and implementation. Apart from fiscal consolidation efforts during the first few years, no serious efforts are taken in respect of necessary economic reforms required to take the country forward. The economic outlook is bleak given the tough external environment and weakening growth prospectus. The Government may not be able to undertake any serious economic reform this year too due to the preparation for the forthcoming presidential election in the latter part of this year.